In-process access is provided using glovebags mounted onto nearby supports or frames, or even using inflatable frame enclosures, e.g. for sampling, rework, additions, extending product batch size, replacing piping skillets, and even cart mounted units for checking pH and other probes during operation. Maintenance is a frequently overlooked requirements in a contained facility. In the example, an entire enclosure containing cleaning and disassembly capabilities was installed in an open area within the facility. Overpacked equipment traveled along access hallways and elevator shafts to be delivered to the maintenance enclosure. Operators accessed the equipment using glovesleeves installed in the enclosure walls, or entered through an airlock fully garbed. The smooth texture of the walls allowed the enclosure to be safely cleaned and collapsed ready for incineration. To allow for the height of the cleaning room the top of the enclosure was fabricated using grommet. These were attached to the frame using bungee cords which allowed the entire enclosure to be adjustable to meet needs. The bagging assembly weighed over 100 lbs and was located close to the floor. Removal for cleaning was unfeasible. Cleaning the rig was performed using a tun dish attachment. Because the entire assembly was electropolished it was possible to clean it in place. 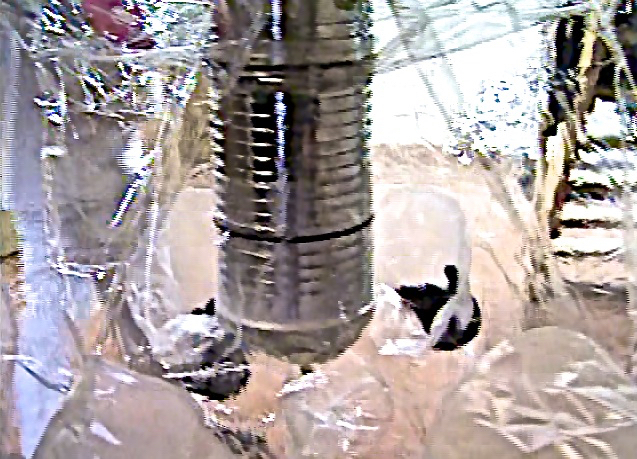 A large glovebag was used to enclose the entire bagging assembly and the tun dish without breaking the seal of the precision fitted bagging head. A feature often lost is the need to conduct extensive clean-up and repair to transportable equipment using overbagging and a flexible retrofitted cleaning room. Such an approach will alleviate quality concerns regarding process cross-contamination. Maintenance shops can be maintained contaminant free by judicious use of many types of mobile flexible enclosures for containing equipment during decontamination and tear-down. The example shown is a multiple level contained enclosure for rear access to equipment. Flexible enclosures make maintenance a simpler procedure since they can be rapidly fabricated, at low cost, to fit almost any challenge. As well as providing containment to 0.2 micrograms/cu.m., and better, they make clean-up a simple process of collapse, remove, and incinerate. Their applications are too numerous to list, but range from small cart mounted glovebags used for in-process instrument performance checks to flange and valve covers, and even enclosures for changing the cumbersome exhaust filters on dryers, or floor installations for product rework requirements. Designs are only limited by the imagination! All flexible containment applications exhibit environmental control functions, through minimizing cleaning waste and disposal. Flexible polyurethane enclosures have been used for extended periods outdoors to contain the environmental waste handling in the arbor. All open operations such as screen cleaning, sampling, piping repair, tightening flanges gaskets, etc. can be enclosed individually and mounted on adjacent attachment points. The longest outdoor use of a single enclosure is 18 years without loss of clarity. The long sleeves for materials pass-through allowed for mutiple operations before the sleeve was depleted. In this case the sleeving was replaced using a large diameter coupling ring for attachment. These glovebags were installed in 1997 and continue in operation.